The sinking of the Titanic, on April 15, 1912, was just the beginning of a protracted transatlantic legal battle, in which those who had lost cargo and loved ones when the ship went down sought to get some compensation from the Oceanic Steam Navigation Company (parent company of the White Star Line). 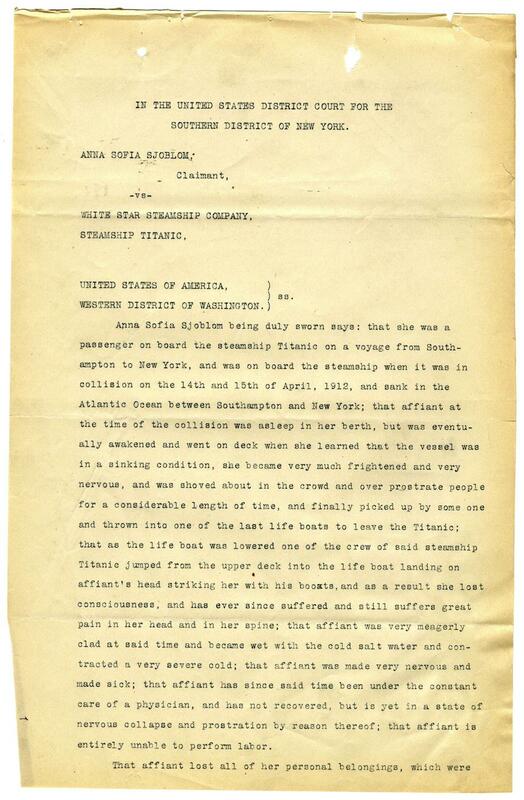 This document, prepared for Titanic passenger Anna Sofia Sjöblom, is one of many claims jointly filed against the ship’s owners by people who made it through the disaster. She became very much frightened and very nervous, and was shoved about in the crowd and over prostrate people for a considerable length of time, and finally picked up by some one and thrown into one of the last life boats to leave the Titanic. The British owners of the Titanic successfully petitioned the U.S. Supreme Court in 1914 to be allowed to pursue limitation of liability in the American court system. Many of the factors leading to the loss of life on board the ship were judged to have been unforeseeable. Hundreds of claimants had joined the suit, asking for more than $16 million in damages. In the end, the company paid a total settlement of $664,000 to be divided among them. While it’s unclear whether Sjöblom received the full $6200 she asked for, she did make it to the Northwest, succeeded in reuniting with her father, and lived to the age of 81. 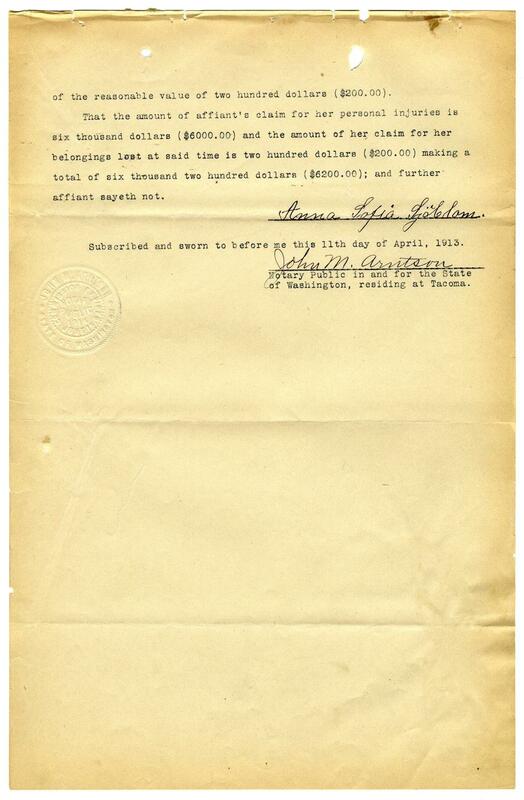 Claim of Anna Sofia Sjoblom, 1913. National Archives.